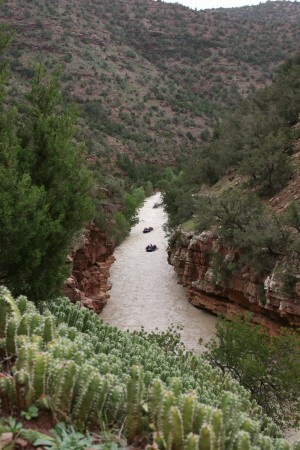 Rafting In Morocco – Who Can Do It? Our team is now well and truly in the midst of our Morocco rafting season. But who rafts in Morocco and what different trips are on offer there? When many people picture Morocco, they think Sahara Desert and lets face it, the rafting wont be very good there! 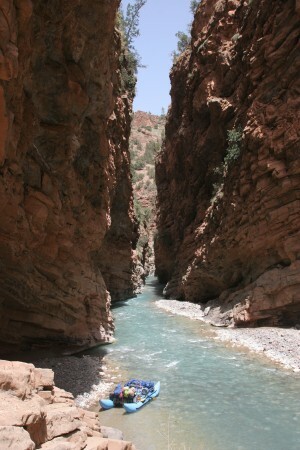 However Morocco is home to the Atlas Mountains and the wonderful rivers that feed from it. The best time to go to Morocco is in fact now in the spring when the run off is at it’s best, however rafting and kayaking can be done until late May when the Ahansel River gets too low to run. The Ahansel River is a perfect Grade 3 river, suitable for both first timers, families wanting to go rafting and seasoned rafters just wanting to go and explore a river off the beaten track. The river trips in Morocco are all of different lengths. Go for a “quick fix” and stay in our Berber Camps for just £210 for 3 days including a stop at Cascade D’Ouzoud, or take your time to raft the entire river from Cathedral to the lake on our Hidden Morocco trip. Water By Nature also offers kayaking trips for Grade 3 paddlers and for complete novices, we run a 10 days kayak school in late April for you to learn from some of the world’s best kayakers. Our clients tell us, they never tire of the scenery and they say that they never realised places like this existed in Morocco. Is This How You Imagine Morocco? Families with children from 10 can join trips in Morocco and our most senior guest was 72. Morocco is just a short flight away with Ryanair or Easyjet from the UK and Europe, so if you are yet to make any plans for Easter, come out and join us for a unique adventure for the whole family. We can even offer a trip to the Sahara or the beach before of after your river trip. we look forward to seeing you here!